How do you stay healthy on vacation? Healthy travel habits are not something casual travelers may think about although a lot of road warriors I know have many systems in place to protect their health on the road. I am one of those terminally healthy people blessed with a great immune system, but I do not take it for granted so I pack a mini-medical treatment kit when I travel. I protect it at all costs and that means I wash my hands so frequently that I’m borderline OCD. When you work in live television, like I’ve done for years, calling in sick is just not an option so I am all about prevention since it truly is worth a pound of cure. When I travel, I have a complete system in place to stay healthy on vacation to protect me from getting sick on the road since I know that there are more germs flying around than I usually come in contact with. Unfortunately, on a recent trip I got caught by a cold. It was my fault because I didn’t completely follow all of my Vitamin C Rules to stay healthy on vacation. You see, in 1998, I was on a trip to Paris when I caught a flu. It was a horrible experience and it took me 30 days to completely recover (including seven days of complete bed rest). I vowed that I was not going to get sick on a trip ever again and I also vowed that I was never going to get a flu again (and I haven’t caught a flu since 1998). Colds, however, are another subject. I have caught colds a couple of times in the past few years on trips to my former home state of Indiana, but using the stay healthy on vacation system I’m going to tell you about, I have never developed full blown cold symptoms, but have actually given some nasty colds a pre-emptive strike. If you follow my stay healthy on vacation system, you can travel cold free and stay healthy while you travel. It’s important to note, that I’m not a doctor (but I’ve played one on TV – I appeared in b-roll portraying a surgeon on a medical video I produced – LOL) so I am not giving any medical advice, just what I call cold & flu prevention suggestions. With that disclaimer said, here is an almost fool proof system on how to stay healthy on vacation. 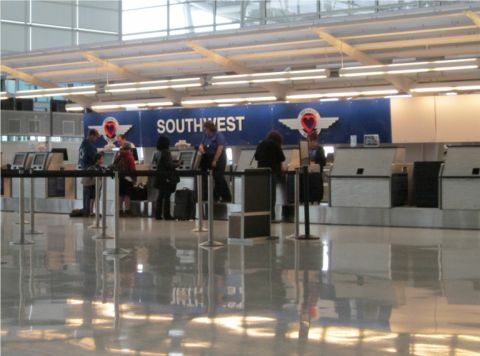 Photo: Check-In kiosks, airports, and airplanes harbor a hotbed of germs. Wash Your Hands. This sounds like common sense, but the number one way that viruses are transmitted is that you touch a surface that has a virus on it and then you touch your face and the show’s over. You’re infected. So to stay healthy on vacation simply wash your hands whenever you’ve touched a surface lots of people touch (including airline kiosk screens, pens at airport shops and restaurants to sign credit card receipts, etc.) before you touch your face. Carry an antibacterial hand sanitizer for this purpose. Also, carry hand lotion to avoid dry skin from the alcohol in hand sanitizers or from frequently washing your hands. 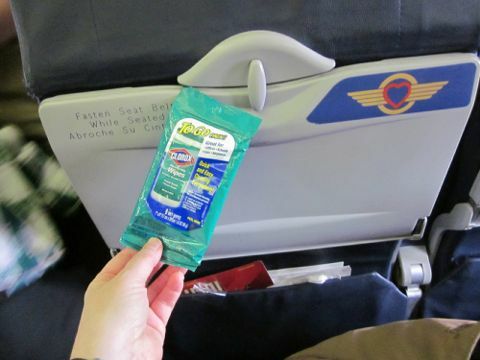 Photo: Use Clorox wipes in travel size to sanitize. 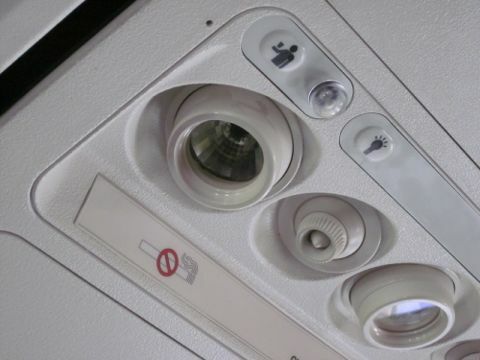 Switches above seat for lights, flight attendant call button and air vent. Headrest area on your passenger seat. You may call me crazy, but there’s one thing you won’t call me: “Sick.” That’s because cleaning these surfaces helps prevent the spread of germs and viruses and will help you stay healthy on vacation. Photo: Sanitize all surfaces in your seating area. Take Airborne Before Each Flight. Ask the flight attendant for a plastic cup when you get on the flight or carry one with you. After you’ve sanitized your airline seat area, pop an Airborne tablet in your cup and add some bottled water (which you should be carrying with you) and take your dose before the flight. I especially recommend this on cross country and international flights. 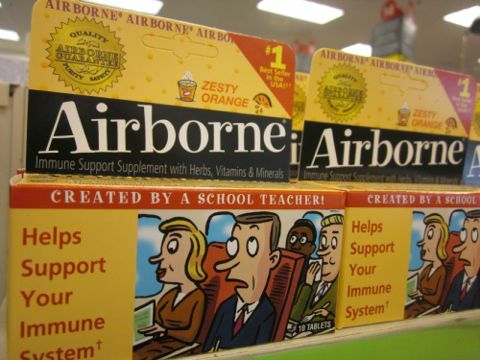 Airborne contains a blend of vitamins and herbs that boost your immune system (primarily 1000mg of Vitamin C). If you’re on a long flight, you may want to take several doses during your flight. Emergen-C is also another option or simply take Vitamin C tablets that may be easier to travel with although the Vitamin C crystals (mixed in water) is more effective as it absorbs into your system more quickly. Drink Plenty of Water During Your Flight and While Traveling. I always buy at least one liter of water to carry with me on the plane (two to three liters for international flights) as staying hydrated will not only help you stay healthy on vacation, but it also helps to avoid jet lag. Make sure you carry water with and drink plenty of water during your vacation or trip as well. In addition to keeping you hydrated, water helps to flush toxins from your body as well. Photo: Wish I'd known about Oscillo in 1998. This kit is especially important for international trips as you cannot get most of these OTC products overseas or they may not be labeled in the same way. Don’t get caught in a foreign country where you don’t know the language having to visit the local pharmacy to get products to treat a cold or a flu. Let’s talk about using two of these supplements, Vitamin C and Zinc lozenges, which I suggest to stay healthy on vacation. 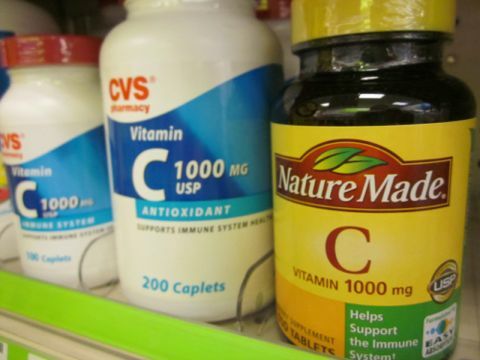 Take Vitamin C in High Doses at First Symptoms of a Cold. Although scientists continue to disagree as to whether Vitamin C can cure a common cold, it is generally accepted that ascorbic acid does boost your immune system. According to two time Nobel Prize winner Linus Pauling, doses of Vitamin C between 4000mg and 14,000mg a day can help battle a cold and lower doses on a daily basis may help prevent infection. I absolutely cannot verify this online, but I’ve produced several TV segments on preventing the cold & flu and I remember in my research that I found a Cleveland Clinic study that reported taking 1000mg of Vitamin C every hour for 10 hours the first day of cold symptoms and repeat taking 10,000mg per day for two more days will cut the duration of a cold in half. So typically a cold lasts for seven days and if you follow the Vitamin C dosage, you will only have the cold for about three and a half days. I can tell you that I have followed this every single time I get an inkling of cold symptoms and I have not been caught with a full blown cold since I have followed this treatment protocol for three days straight. It’s important to note that doses of Vitamin C in excess of 2,000 mg per day may cause intestinal discomfort and bloating although I have never found this to be true for me. I do understand that everyone is different and from what I understand, if you experience these side effects then simply discontinue taking the Vitamin C and the side effects will go away. Photo: Zinc lozenges are essential travel companion. Take Zinc Losenges like Zicam. 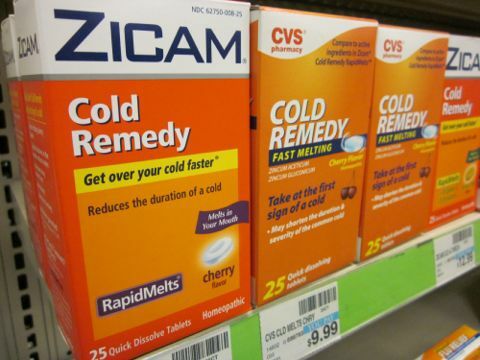 Another natural cold remedy involves taking zinc lozenges that several studies have reported to reduce the average duration of cold symptoms by fifty percent. In fact, a 1996 Cleveland Clinic study found that zinc lozenges reduced the average duration of cold symptoms from seven days to only four days. According to George Eby, who conducted the initial study on zinc, zinc ions may interfere with the replication of cold viruses in the throat. More recent research suggests that zinc may owe its cold-fighting properties to its effect on our immune system, rather than directly on the virus. With this research, many experts now recommend sucking on a 23mg zinc lozenge every two hours at the first sign of a cold. It is Imperative You Start Treatment at the First Sign of Symptoms. I cannot stress enough that it is imperative you start taking Oscillococcinum, Vitamin C and/or Zinc lozenges at the first sign of symptoms in order for it be effective at knocking down your cold or flu. You cannot be in denial that you may be getting sick for more than an hour as the longer you delay these pre-emptive strike suggestions, the more chance the virus or cold has an opportunity to infiltrate your body. Photo: Start preventative treatments at first sign of illness. Eat Healthy Meals including Raw Fruits and Vegetables. I usually stop at a local market near the hotel, home, or location I’m staying at (especially on longer trips) and pick up organic fruits and vegetables to have in my room. I also carry a small supply of Ziploc bags so that I can easily carry these healthy snacks with me on my travel activities and excursions during the day. I work toward keeping the same healthy routines I follow at home when I travel to guard my health at all costs and to stay healthy on vacation. Do be cautious in certain countries where washing fruits and vegetables with local water could contaminate your produce. Always use bottled water in those circumstances. Don't Forget About Hotel Room Cleanliness. Once you arrive at your destination, don't forget about hotel room cleanliness to stay healthy on vacation. 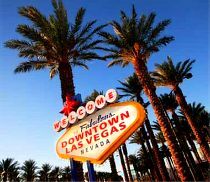 You'd be surprised at the added measures needed at your destination especially during cold and flu season when you're more vulnerable to infections. Remember to Consider Travel Medical Insurance. I have a travel medical insurance policy through American Express that costs a little over $100 a year that covers me around the world. Any American Express member can purchase this policy which I feel is essential to stay healthy on vacation. 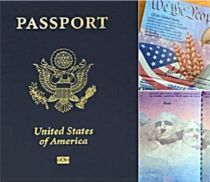 If you don’t have American Express, consider Medjet Assist or Travel Guard policies. No one plans for a medical disaster when they travel, but you should be prepared for one. Several friends of mine have had unexpected medical situations abroad and did not have insurance plans so they really got hit hard financially. Your health insurance plan may not travel with you. Plans available through Travel Guard can provide you with coverage for unexpected medical expenses while on a trip. Also, Medjet Assist arranges hospital of choice medical transfer if you are hospitalized virtually anywhere in the world. Finally, if you’re traveling overseas, don’t forget to check out if you may need certain travel vaccinations before you go. Photo: Don't forget to pack Airborne in your carry-on luggage. Some people may “poo poo” these tips on how to stay healthy on vacation. In fact, I’ve seen credible news anchors and reporters file reports on the air that say many of the remedies I’ve told you about don’t work (i.e. Vitamin C, etc. ), but I’m giving you this advice because I’ve followed these procedures to prevent illness when I travel and they work time and time again for me. Just as calling in sick is not an option for me when I have a live TV broadcast to produce, getting sick when I travel is not an option either because I don’t have time to be sick when I’m in a fun and exciting place – or even just visiting family. Time is too precious to be sick so I do everything I can stay healthy on vacation. It’s important to note that I just recovered from a cold I caught on a recent trip to Indiana. It’s my fault that this cold ran it’s complete course (10-14 days) on me. 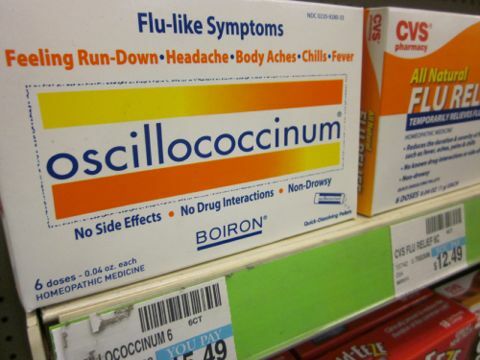 I started feeling sick with a sore throat and IMMEDIATELY started taking 1000mg of Vitamin C every hour on the hour and because I wasn’t certain if I may have caught a flu, I also started a three-dose treatment of Oscillococcinum. I was feeling so much better by the end of my second day that I did not complete the third day on the Vitamin C which I believe was my “fatal error.” That combined with getting up in the middle of the night to watch the Royal Wedding broadcast live derailed my rest & recovery efforts completely and sent me into a relapse. It was a big mistake not following my own tried and true advice. But sometimes we get sick for reason…to appreciate our good health when it returns so we can protect it even more. I firmly believe that if you follow my suggestions you will stay healthy on vacation.